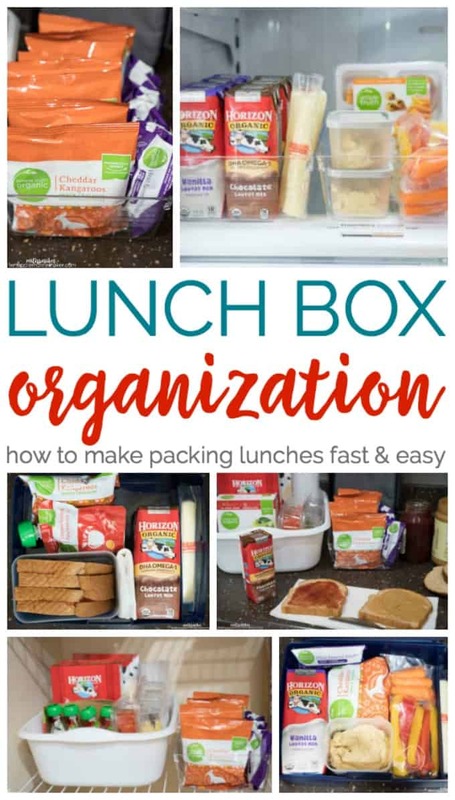 Lunchbox Organization - Make Packing Lunches Faster and Easier! 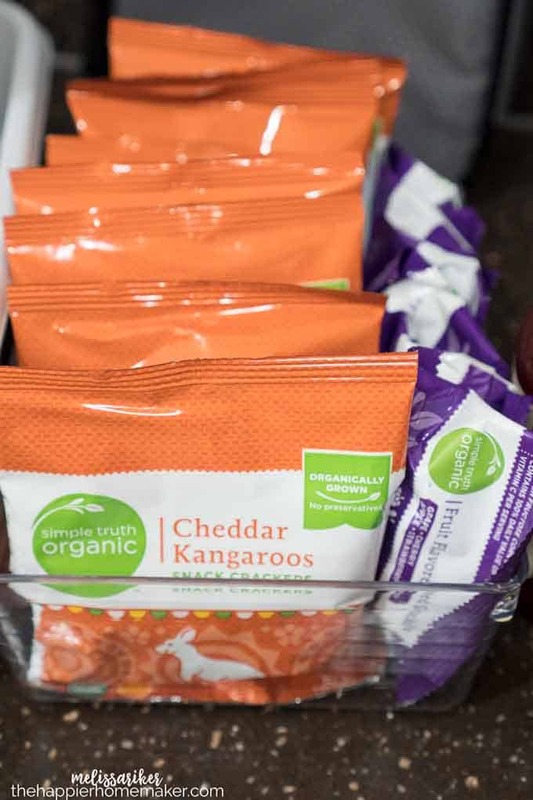 All three of my boys like packed lunches and all three eat totally different things-so without an organized approach I’d be driven batty for sure. Here’s how I like to make lunch box packing easy. 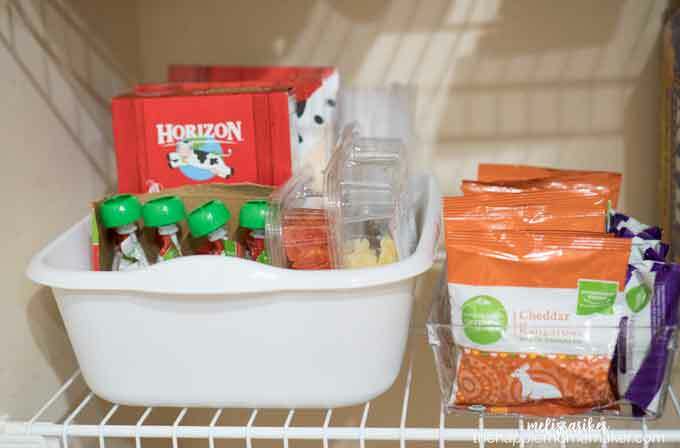 First I use some dollar store bins in the pantry to corral all the snacks-I keep the baggies in there with the snack boxes too so I (or my boys) can pack crackers and other snacks easily. 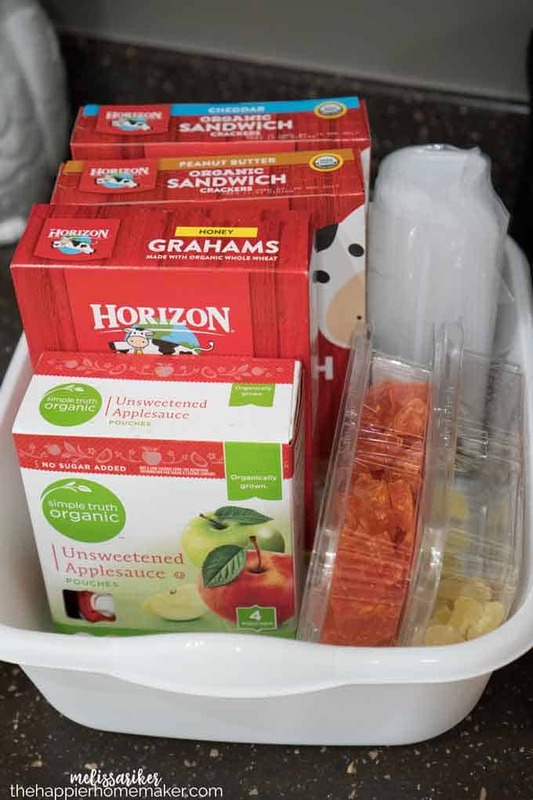 I also use a smaller bin in the pantry to store individually packaged snacks so that they are easy to grab and go-the boys get a snack time at their school so these can be easily tossed in the bookbag separately from their lunch bags. I keep all of these snacks on the bottom level of the pantry so the kids can easily grab them if they are helping make their own lunches. 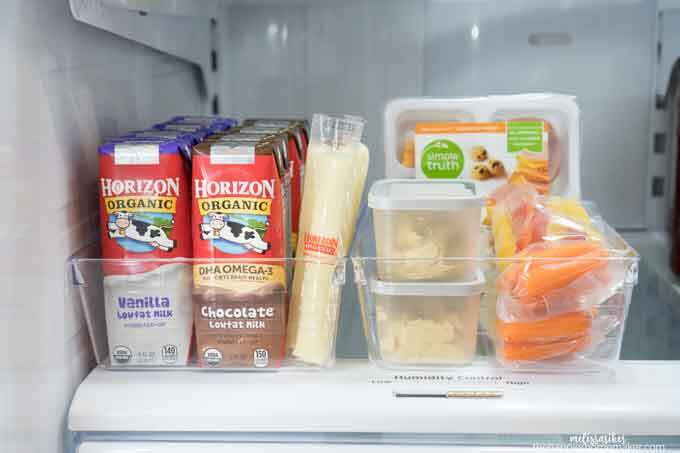 I use the same system in the fridge on the bottom shelf for easy access! 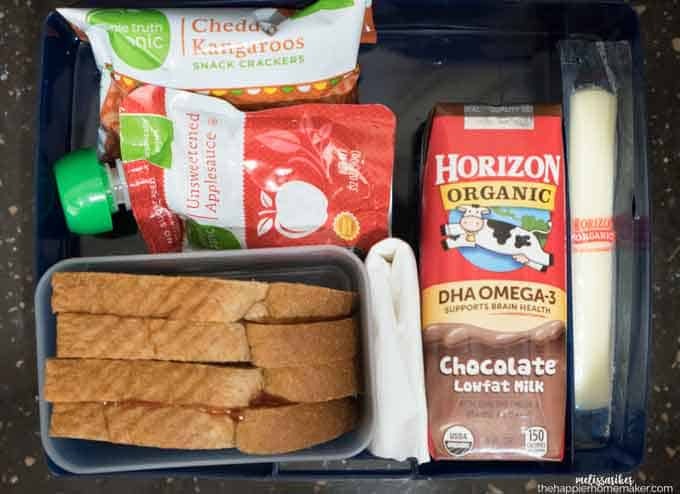 My youngest son is a big fan of the pre-made lunch kits-he especially likes the little pizzas so I usually keep a few of the ready made packs on hand-they are great for days when things get hectic as well! 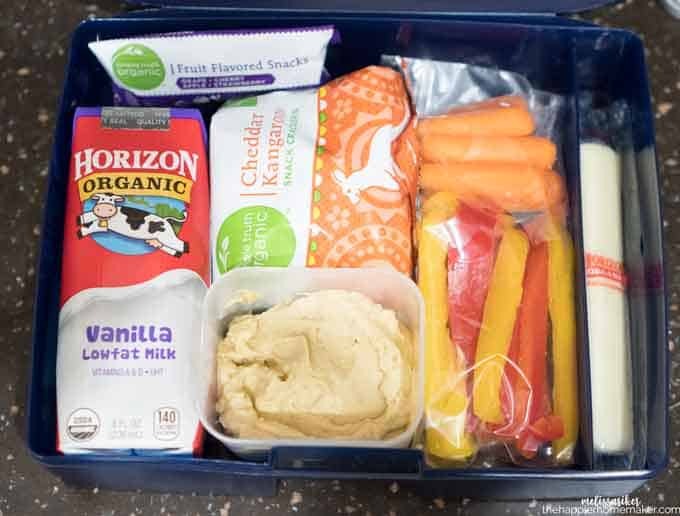 My middle son is my pseudo-vegetarian and doesn’t like sandwiches so I package up veggies and hummus for him to grab quickly. Everyone grabs string cheeses and milks as well. 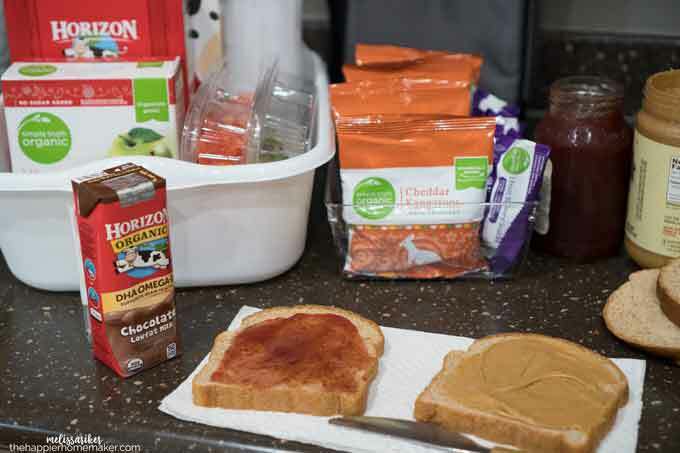 When I’m packing the lunches I usually grab all the bins and put everything together on the counter-it’s super fast and easy to have everything on hand and ready to go since I’m filling three different lunch boxes at once. …and the youngest gets his pizza fix along with milk and fruit snacks. Too easy! 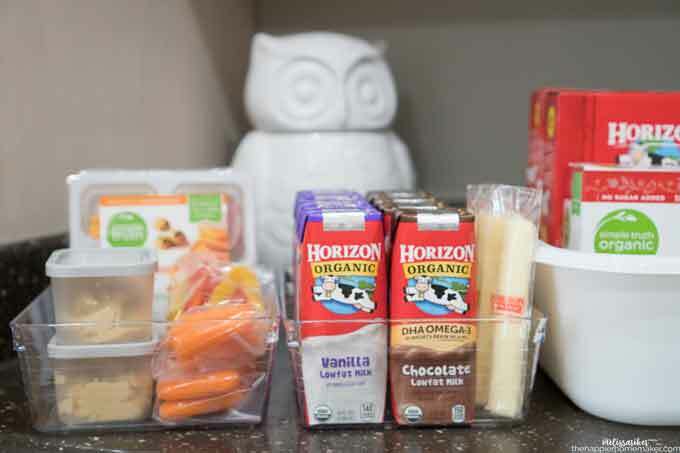 If you’re getting into the swing of lunch packing season again try organizing your foods in bins as well-it really does take the stress out of packing lunches! 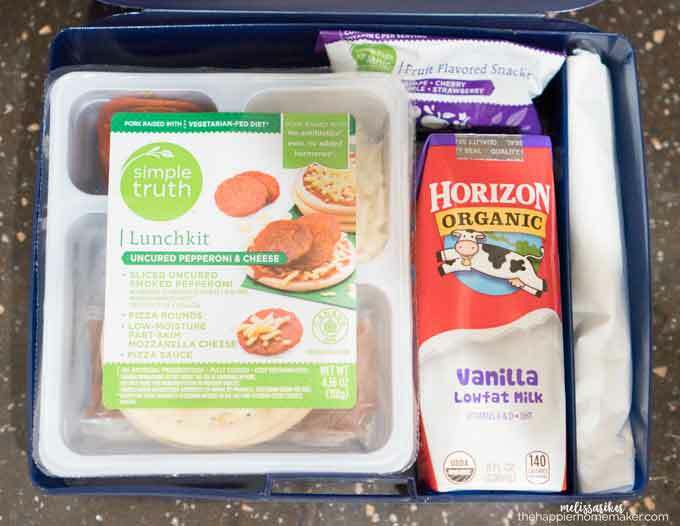 What are your favorite lunch box packing tips-leave them in the comments below!